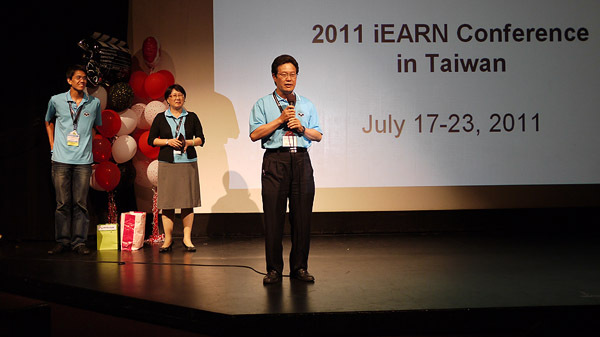 In total, there were 44 countries/regions at this conference, 520 people getting together!International conference participants 240, while 228 students are in Youth Summits, and 36 iEARN Taiwan Team members. Friday July 15th 2011 – After 12 hours flying, now a 3 hour stop over in Hong Kong, and then on to Kaohsiung. Landing in Kaohsiung showed an alive and lighted city. Saturday July 16th 2011 – The first day of the Assembly Meeting. top – The conference bags are so beautiful and created from reused political campaign banners. At every iEARN conference some GTP coordinators meet :-). And then.. the famous iEARN Cultural Evening with contributions from 20+ countries.Fourth in row the Dutch team with “Tulips from Amsterdam” and a super “klompendans”. Thank you conference organisors for that special ‘black Taiwan Team T-shirt’ received for help offered!And to end the whole Taiwan volunteer group on Stage.. want an amazing team!